There may be no better time to visit the Valle Vidal than in the fall when its giant groves of aspen trees erupt with vibrant colors and turn this part of the national forest into a stunning display of natural art. De Lucas said the aspens should be in full, fall colors this weekend due to recent warm days and cool nights and a lack of inclement weather that can strip the trees bare. But a storm is expected to be moving through the area next week that could do just that, so foliage fanatics should get out this weekend while the weather still holds, she says. 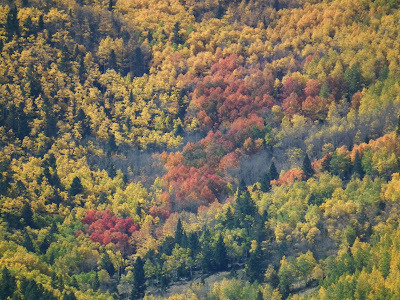 Colors have been especially vibrant this year with a rare shade of red making an appearance among some of the golden aspens, De Lucas said. A drive on the well-maintained gravel road, wending through the Valle Vidal, Forest Road 1950, provides visitors with the opportunity to enjoy some of the finest fall foliage the state has to offer. 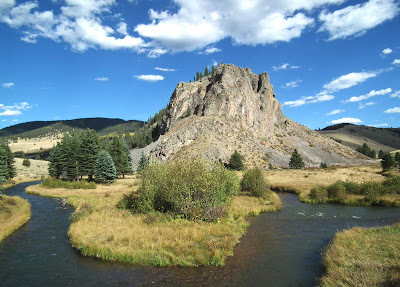 Located just north of Taos on the Colorado border the 100,000-acre Valle Vidal unit of the Carson National Forest offers great fishing and fantastic camping also. Donated to the public by Pennzoil in 1982, the Valle Vidal has attracted many to its high mountain meadows, lakes and streams over the years. It’s fabled among anglers for the colorful, native, cutthroat trout that inhabit the Rio Costilla, Comanche Creek and other backcountry streams. Many of those streams were recently rehabilitated to rid them of non-native fish and then restocked with pure strain, native, cutthroat trout. The fish is noted for a distinctive red slash under its jaw and other highly colorful body markings. 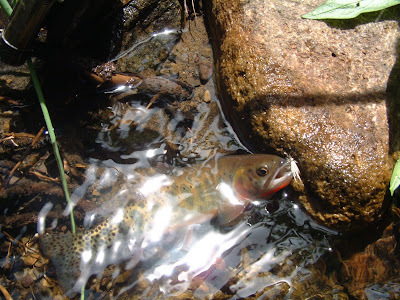 And big rainbow trout are regularly stocked in Shuree Ponds where an angler’s chances of catching a nice one are as a good as seeing a bear or other wild animal wander by. Wildlife thrives throughout the Valle Vidal which has special restrictions in place to protect its vast elk herds during the early summer calving season. The unit is a favorite among hunters for its big game animals and is a “once in a lifetime” hunt for trophy bull elk. A trip to the Valle Vidal almost requires an overnight campout where elk can be heard bugling or coyotes howling across the vast open meadows. Camping on the Valle Vidal is restricted to the two established campgrounds or in the backcountry, at least a mile from any road and where no motorized vehicles are allowed. Backcountry campers must park only in designated parking areas or in one of the two campgrounds and then hike in. Cimarron campground located near Shuree Ponds usually fills up first on weekends while McCrystal, on the other side of the mountain, usually has plenty of sites available. McCrystal campground attracts a lot of horseback riders because of its corrals and proximity to open meadows. At McCrystal campground visitors will find interpretive displays along a trail to the nearby Ring Ranch homestead where several original log buildings have been restored and are occasionally still used by the Boy Scouts, Forest Service personnel and the occasional working cowboy. At Cimarron Campground visitors will find Little Shuree Cabin, across the road from the Cimarron campground entrance, has been restored by a crew of military veterans this summer. Located on Ponil Creek, the log cabin was once part of the Vermejo Club, a hunting camp where the likes of early Hollywood producers, Cecil B. DeMille, and Mary Pickford, stayed and carved their initials into the interior logs. A recent fire razed the historic cabin but the crew of five vets has since resurrected the building in which some of the logs bearing its visitors initials will be displayed again, De Lucas said. 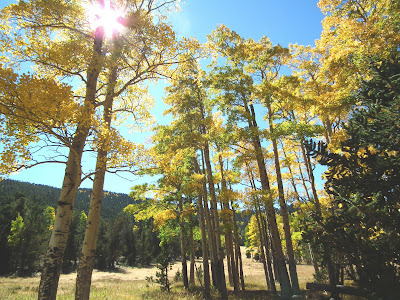 Visitors to the Valle Vidal can see plenty of fall foliage by driving through the forest to Cimarron and then looping back though Eagle Nest and Red River to Questa. At Eagle Nest, one could also take Taos Canyon to town or head south for a return trip through Mora and Penasco. Any of these routes make for fine fall foliage excursions, consult a map and get out there. Leave Santa Fe on US 84/285, proceed to Espanola, stay on the main drag and head up State Road 68 along the Rio Grande to Taos, proceed through town and follow State Road 522 through Questa, north to the village of Costilla and then take State Road 196 into the Valle Vidal. Follow Forest Road 1950 up to Shuree Ponds and the heart of the Valle Vidal.